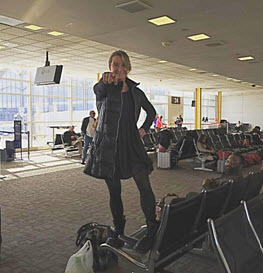 Because of this unanswered need (and because I like challenges), I upped the ante to run 100 marathons, raise a MILLION dollars, AND compete in my first IRONMAN. (November 1 in Panama City, FL) Let me tell you, IRONMAN training is no walk in the park. This is an event to be respected. Just getting to the start line uninjured is an accomplishment. 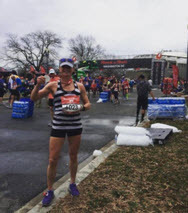 I knew I was in trouble — haha — when I asked my IRONMAN coach “Does this marathon work with my training schedule” (remember that I’m still running monthly marathons) and she says, “Yes, it’s a week to taper.” Wow, she considers running a marathon to be a recovery. NICE! Typical training Saturdays: leave the house by 6AM with three PB&J’s, pretzels, GU’s, and fruit stuffed into the back of my bike shirt (along with bike pump, sunscreen, water bottles behind the seat) and bike 100 miles on the Washington & Old Dominion trail. THEN, once I finally make it back home, run 6 miles. This is called a brick workout. Clearly I collapse and am incoherent for the rest of the day, much to my family’s delight. 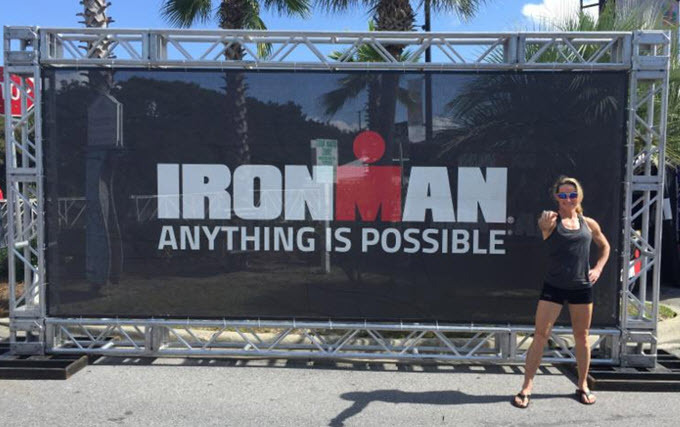 Just in case you didn’t know, an IRONMAN is a consecutively executed 2.4-mile swim, 112-mile bike ride, then a 26.2-mile run. 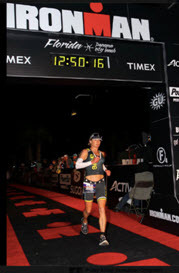 And when you cross the finish line, the announcer proclaims (I hope this happens): “Brooke Curran, you are an IRONMAN” or just “plain crazy” (some of you may be thinking). In reality, I love the new training regimen and the new goals (like going from not being able to swim the length of a 25-yard pool to swimming 2.5 miles in the Potomac River as a training swim). Last thing to conquer… swim-ANXIETY. I know I’m strong enough, but it’s my fear of drowning (with no one knowing that I’ve sunk) that terrifies me. All I need to do is just survive the swim (without drowning, of course, and under the time cut-off), manage the bike and I’ll be home free on the run (relatively, speaking). I’m still in disbelief… It really happened! 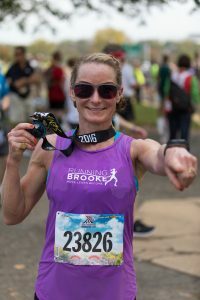 … so RunningBrooke was founded on the principle of pushing limits, doing things scary, and combining a passion for running (79 marathons and counting) with a compassion for the community. It’s all about leveling the playing field. 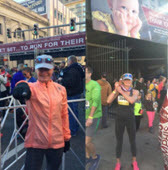 To celebrate our 5th year, I decided to set my sights a little higher with a new physical goal, an IRONMAN – totaling 9 months of heavy duty training. This new goal parallels growth in RunningBrooke. It reveals how we aim to expand and be a game-changer for at-risk kids. 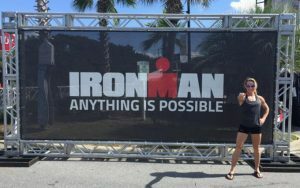 The good news is that I made it back from the IRONMAN in one piece and raring to compete again! The bad news is that the swim portion of the IRONMAN was cancelled. Literally, as we were standing on the beach in our wetsuits in 40 degree weather, mentally steeling ourselves to wade in and pierce the dense breakers, an announcement informed us that, due to rip tides and unsafe conditions, the swim was cancelled. Many fellow competitors cheered. I was wrecked and felt cheated. A year ago, I couldn’t swim the length of the pool, and I was FINALLY ready, both physically and mentally, to swim 2.4 miles but was not able to test my mettle. But while I biked the 112 miles, I had some time for reflection. OK, so the race-day IRONMAN “A Plan” was nixed. In the grand scheme of things, really, “so what?” After I got over it and had time to think and focus on what the “B Plan” looked like, something occurred to me. In some small way, the swim cancellation and the resulting “B Plan” is sort of like what at-risk kids face every single day. These children’s “A Plan” was squashed simply by being born at-risk. We, all of us, are their “B Plan,” as we fill the gaps, sustain and satisfy their needs. This is what I thought about through the 112 miles, as I fought against the winds to make it to the next aid station. That, and not getting taken down by superior riders cutting too close as they passed. Sad to say, I got passed a lot, toddling along on my very-decent road bike, but certainly no tri-bike, biding my time til the run. Still incredulous, even though this was the segment that I was looking forward to, I was happy to run after spending 7 1/2 hours out on the bike course. So pumped in fact that I ran the first half of the marathon way too fast. It was the “high” of doing my thing, passing people, being “almost” done! But as the sun set, and I foolishly tossed my long-sleeved shirt, the early miles caught up to me. I got colder as it got darker, and my mood became dispirited. The lead-footed miles between 17-19 were particularly gloomy; I walked through multiple aid stations and refueled with anything hot and salty, talking to myself and determined to pull it together: “light and loose”, “just don’t stop”, “can’t let people down”. And I did cross that finish line, and I did hear my name. It really happened! Overjoyed and overcome, emotion sent me to the medical tent with an asthma attack. A little oxygen and chicken broth later, I was walking out of the tent with a huge smile. Onward and upward! February was a bust as the marathon was cancelled mid-race due to snow accumulations and conditions. I made it to mile 12, then ran back to the car for a total of 15 miles. Determined to finish, I did the remaining 11 miles on a treadmill. Just had to get it done! Great to be back in Beantown! Through the wetlands and marshes near Dewey Beach. Had my favorite pre-race dinner of pizza. Spectacular trail marathon run through parks and along streams. Came home with a cuckoo clock – best award, ever! — for first Master Female. Headed back to Appalachian State University for this net-uphill race in the Appalachian Mountains. I remember it being (relatively) enjoyable and scenic. Small and congenial, on-site race parking, shaded and historic, another marathon repeat. This is my buddy’s last state on his 50- state marathon quest, so I headed up there to run it with him. Last Saturday’s IMFL finish (2.4 mile swim, 112 mile bike, 26.2 run) ups the total marathons run to 91. Hard to believe! People often ask what I think about during all those miles and hours. Sometime a lot, as the exercise puts me into a “flow” where nagging problems become clear. I think quite a bit too about the at-risk kids we all help through you and your generosity. 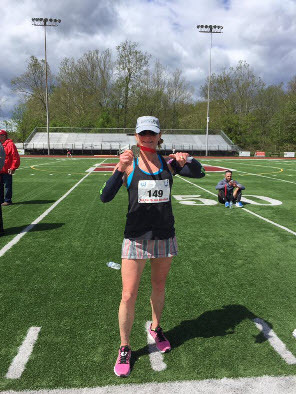 Sometimes the races are (relatively) easy, and sometimes they are quite hard (high elevations, extreme conditions or temperatures exacerbate the asthma and exercise-induced bronco spasms that I run with). Regardless, the miles are nothing compared to the hardships many people face in our community every day. I feel very lucky. 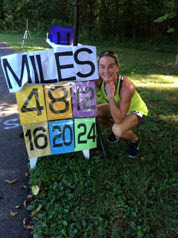 Have now officially run 24,000 marathon miles while at the St. Jude’s Marathon in Memphis, TN. That doesn’t even include training miles. Incredible! 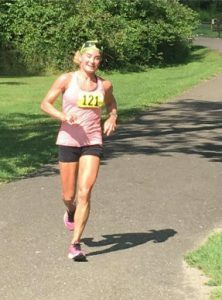 Watch the NBC News Channel 4 interview with Brooke about reaching her 100th marathon goal. The temperature was cool, the course had beautiful scenery and LOTS of challenging hills. 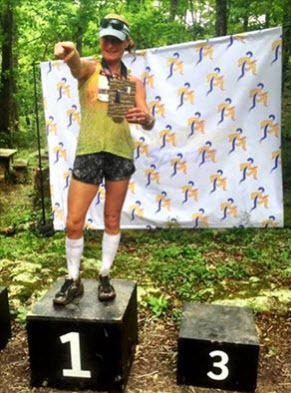 Despite the hills, I placed 1st in my age group! The temperature was cool-ish for August and the course was beautiful with lots of shade. Another 1st place in my age group!